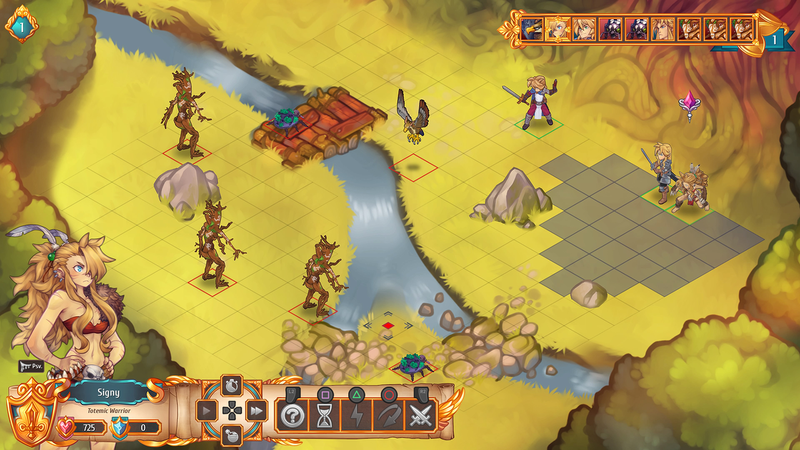 I didn't really want to sit down and write this review of Regalia. Doing so is going to take hours out of my life and... the game's just not worth it. But in the interests of being professional, here we go: there's nothing outright wrong with Regalia. In fact, it has a perfectly decent tactical combat system - not necessary original, but well executed and enjoyable. For people who love their JRPG combat systems, this one will competently scratch an itch. But in every other area it's also so painfully insipid that I can't honestly say I'll ever want to think about the game again. Much less play it. Which hurts, because I love this genre. Regalia is an attempt to do a comedic JRPG. It tells the story of a king of a once powerful kingdom that, in the process of reclaiming his heritage, discovers that his family has racked up a massive debt, and he'll need to work hard over a period of time to pay that back. Yep, even kings need UBIs. In execution this means a mix of tactical combat (a little like what we see in The Banner Saga) and Atelier-like time management as our king needs to travel all over the place in order to do the things that he needs to do to pay back the debts. The challenge comes from the fact that there will always be more things to do than time allows. Like Atelier, though, this time management never becomes too intense, because it's turn based itself; and it's only when you move from one place to the next that time ticks over, so you've got plenty of time to decide what priority is the most important. The actual gameplay of Regalia works really, really well. I love games with turn-based time management like Atelier. 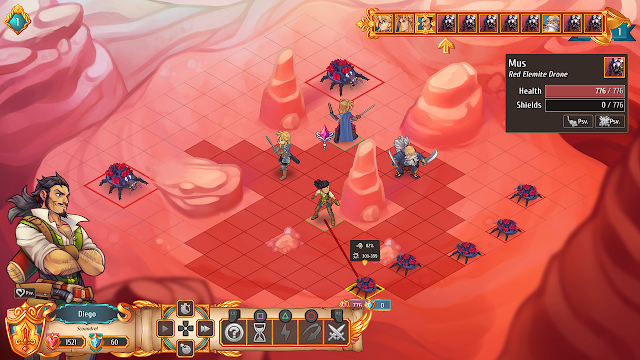 I love The Banner Saga, and I love the similar way in which the combat plays out in this game. Rather than relying on standard attacks to get through each battle, each battle has the potential to be incredibly difficult, and each character need to fight using a full range of different special abilities. In addition to doing damage or boosting allies, the special abilities of Regalia's characters usually have secondary features, whether that's to stun, blind or otherwise incapacitate an opponent, or to help you control the territory around you. Each character's special abilities are different and yet complementary enough that Regalia is quite nuanced and tactical on the battlefield. It's also willing to be punishing; I nearly lost one of the very first battles because I was a little too careless and even the most basic of enemies can hit hard if you're not paying equal attention to your team's survivability. At any point where I let my mind wander for a turn a two I'd find myself snapping back to attention in the middle of a catastrophe from one tactical error or another. On balance, this combat system is engaging, and certainly challenging enough to be worthwhile. There are issues with it, though. This is a game in which a missed attack can easily tip the scales over to a loss, and yet characters are a little too incompetent and miss attacks too often. As such, I came to rely too heavily on "sure thing" options, which had the snowball effect of limiting my approach in most battles. Across the entire party of heroes that I could take into battle, I quickly found myself relying on a specific team and used their abilities in a specific pattern in order to progress through most battles. I assume that there's alternative strategies to take into battle than my default approach, but the game does a poor job in encouraging players to experiment and find new ways to play. It's unfortunate that such a elegant combat system would allow randomness to let it down, but there you go. You could probably also argue that the limitations to the game's save system means that the overly long battles are counter-intuitive, but given that most consoles now allow for in-game suspension, it's not the issue it might have otherwise been. Combat is only one part of an RPG, though. While Regalia generally gets that side of things right, the rest of the game is a mess. The biggest problem first; it tries to be comedic, but isn't funny on any level. Of course, comedy is about as subjective as tastes come (and that's the great risk when making a comedic game), but I don't find playing to stereotypes and creating shallow caricatures to me particularly endearing. Yes, we get that the new king is a lazy oaf and an idiot. That doesn't make it funny when, apparently on a whim, the first thing he does when exploring a long-abandoned building is to beeline to an urn filled with ash, drink from it, and act surprised that it was his deceased grandfather and not a cup of tea. That crap isn't funny. It's too hyperbolic to be funny. It's over the top in a way that can only be described as 'childish'. And that happens in the tutorial; the game doubles down time and time again on that exact tone the further in it gets. Attempts to break the fourth wall are every bit as forced and laboured, and the stereotypes the game indulges are borderline at times ("but it's okay," the game tells us with all the sense of irony of a person dressing up in blackface despite knowing the connotations of blackface "we know this joke is racist so it's not really racist"). The game is never trying to be offensive, and I don't think anyone will take offense at it. And I'm also sure that it will tickle the funny bones of people that do get a laugh out of cheap-and-childish. But the point of all this is to highlight that Regalia rests so heavily on its sense of humour for its story that for people for whom it misses the mark - such as me - it comes across as trying far, far too hard. Genuine comedy doesn't grab you and shake you while screaming "I'm funny, damn it! Laugh!" And yet, that's the perfect metaphor for what Regalia does to its players. The presentation is about as subtle and graceful as a Saturday morning cartoon, too. In battles there's a lot to like, with varied and vivid character and enemy designs, but the profiles of characters during dialogue sequences are generic college design project stuff, and maps and environments verge on the overbearingly colourful. I like rich and vivid art in my games, but there's a vast difference between something like Persona 5, which uses that depth of colour to unique aesthetic and narrative effect, and Regalia, which is dime-a-dozen stuff... and again, has the airs of a university project. Now, with all of that said, nothing about Regalia's design and presentation went do far that I couldn't keep playing. As I said at the start, I enjoyed the combat system enough that I was able to push past the nonsense. I finished it, which is more than I can say about a lot of other games that try to be funny and land on the wrong side of my funny bone. 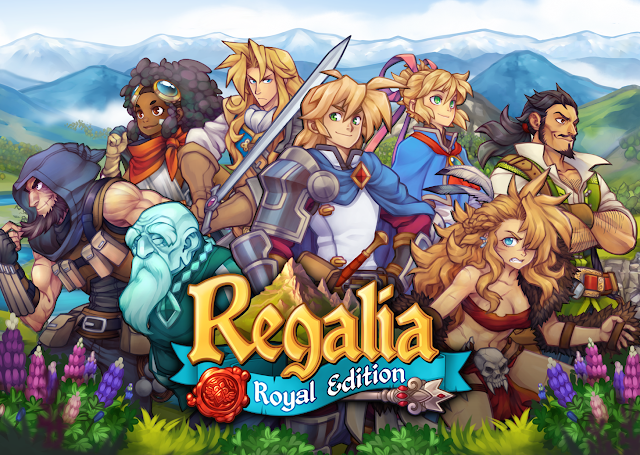 On that basis I've got to say that Regalia does work as a homage to the genre and something to play on a lazy weekend. Sadly, that's hardly an inspiring way to describe a game, and that is Regalia in a nutshell. Anything but inspiring.